Highland Tank’s Oil/Sand Interceptor (OSI) is treatment tank designed to intercept and collect sand, grit, free-oil and grease (hydrocarbons and other petroleum products) in a wastewater flow, and prevent their entry into the sanitary sewer system. Additionally, our elevator sump pump and oil interceptors are designed specifically to remove hydraulic and other oils and volatile liquids from in and around elevator pits. 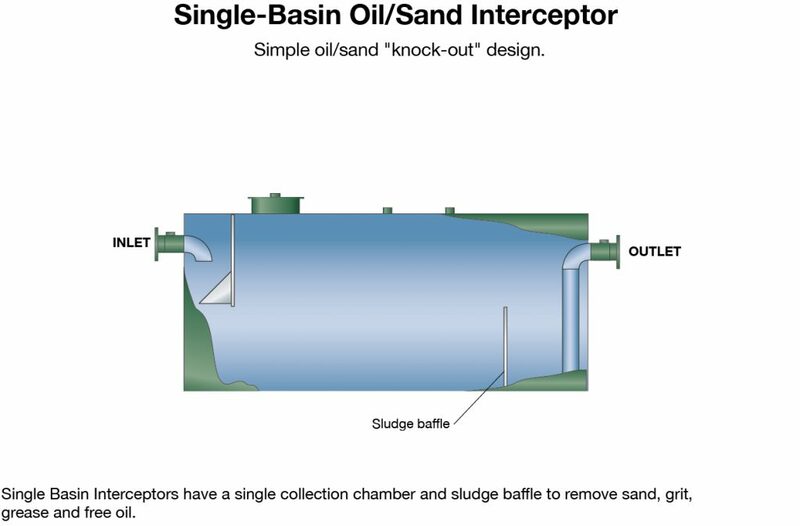 Oil/sand interceptors contain one to four compartments (basins) where oil separates and floats to the surface, while sand and grit settle to the bottom sludge baffle. Denser, cleaner water flows through the compartment(s) until it is discharged from the interceptor. Designed to accept gravity flow, the interceptor’s volume and design, provide ample retention time to enhance the removal of sand, grit, free oil and grease to be removed from the wastewater due to their differences in specific gravity. OSI sizing and construction conforms to recognized plumbing codes and meets or exceeds many municipal industrial sewer pretreatment regulations. Interceptors are available in double-wall construction for locations where regulations dictate. Interceptors can be sized for greater volumes and retention time and are watertight and pressure or vacuum-testable in the field if needed. An extensive range of standard sizes and capacities is available along with customization of capacity, arrangement, dimensions, and pipe penetration locations to fit your specific requirements. Leak and level sensors, alarm/control panels, influent, effluent and oil pump systems along with High-LINK® monitoring systems are available. The High-LINK® Integrated Systems couples Highland Tank’s superior steel tank products with state-of-the-art electronic management devices and proprietary software to provide real-time data to decision-makers. With our High-LINK® applications you will have the power to optimize the usage and transfer of all your liquid operations. Learn more here. 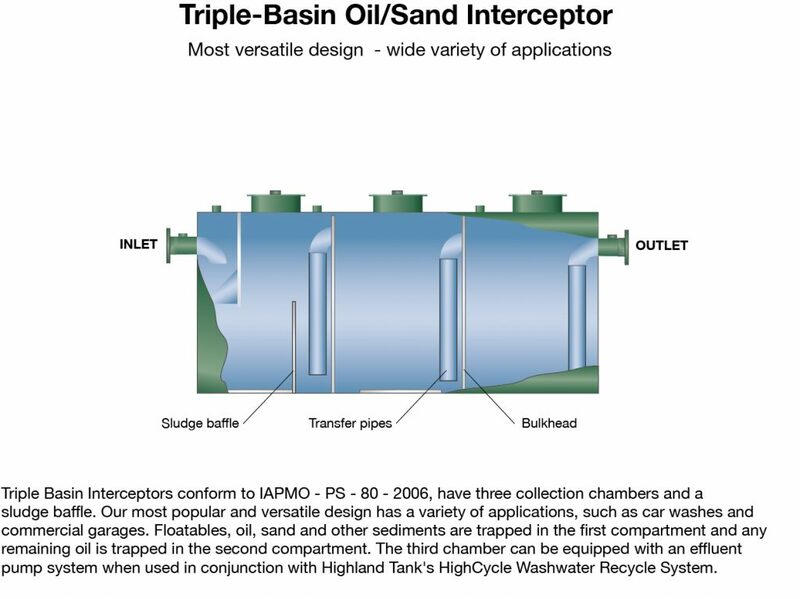 Highland Single, Double and Triple Basin Interceptors collect sand, grit, grease and free oil (hydrocarbons and other petroleum products) from storm water runoff, spills and vehicle maintenance operations. Interceptors can be used in conjunction with high-performance oil/water separators. 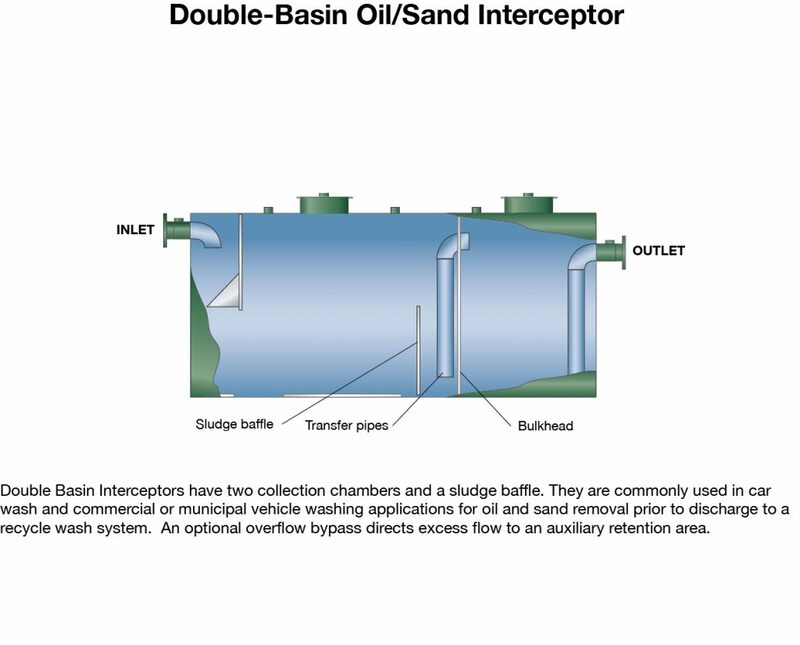 Double or triple basin interceptors may be connected directly to a sanitary sewer system or used in conjunction with a recycle wash water system. Manual Oil Interceptors (MOI) trap sediment and retain free-floating oil and grease from wastewater discharged into floor drains. MOI prevent the discharge of sediment, oil, grease and other substances harmful or hazardous to the building drainage system, the public sewer or sewage treatment plant or processes. MOI are constructed of mild carbon steel and coated with heavy-duty polyurethane for superior corrosion protection. Available with a convenient, integral side oil compartment, (MOI-SO) they are suitable for installation in almost any location. Highland Tank Elevator Oil Interceptors help prevent harmful discharges from entering a building’s drainage system, the public sewer, sewage treatment plant or other treatment processes. They are designed to trap sediment and retain free floating oil and grease, like petroleum hydrocarbons and other harmful liquids, in wastewater discharged from elevator pit sumps. Elevator oil interceptors are constructed of mild carbon steel and coated with heavy duty polyurethane for superior corrosion resistance. Highland Tank’s elevator oil interceptor has been third party tested for durability and reliability is suitable for installation above or below grade in configurations to fit almost any requirement. Highland Tank Elevator Sump Pump Interceptors are designed to trap sediment and retain free floating oil and grease, like petroleum hydrocarbons and other volatile liquids, in wastewater discharged from elevator pit sumps. Hydraulic oil in an elevator sump is a code violation and a danger for all personnel working on and around the elevator equipment. It can also cause damage to the elevator equipment and a potential contaminant to the environment. Hydraulic oil can penetrate concrete, seep into the ground and require environmental remediation. Sump pump interceptors are suitable for installation above or below grade and are available in configurations to fit almost any requirement. Highland Tank Collection Catch Basins (CB) are designed to capture sand, grit, debris and associated pollutants discharged from vehicle maintenance and fueling facilities and then prevent their entry into the drainage system. When installed in conjunction with an oil/water separator, the catch basin acts as a simple pretreatment device to collect this trash and help prevent it from clogging the drain lines. This also results in less waste material entering into the separator. Catch basins are easy to install, operate and maintain. The catch basin’s removable drop-in wastebasket collects trash that may be deposited at the service bay drains or fuel islands. A second screen, welded inside the catch basin, further protects the separator from incoming waste. Highland Tank & Manufacturing Company, Inc. Copyright 2019 Highland Tank & Manufacturing Company, Inc.